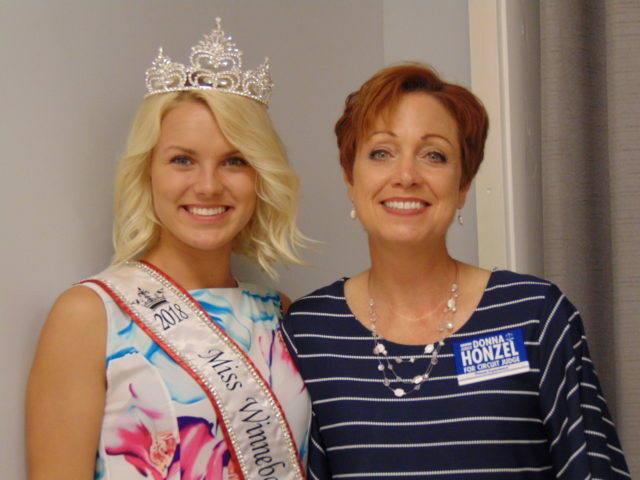 Miss Winnebago County, Alexi Bladel, joined Judge Honzel at the Capron Meet & Greet event. Judge Donna Honzel is running for the 17th Circuit Court Judge position. This Circuit Court position covers Boone and Winnebago Counties. 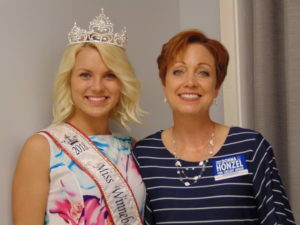 On Thursday, Aug. 30, Gayle and Jason Kruckenberg hosted a Meet and Greet for her at the Capron Lions Club Community Building from 6 to 8 p.m.
“When it was suggested to me that I run for Circuit Court Judge, I had to really think about it,” Judge Honzel said. “I am successful where I am. But, I decided I could make a bigger difference as a judge. It’s just too important not to. If you don’t get the right people in the position, you can’t be sure that justice is fully served. “Judge Collins is retiring and I am running to fill his position. My opponent has chosen to be a politician. He has never tried a case. How can someone who has never tried a case be in charge? He would have a very steep learning curve. For complete article, pick up the Sept. 6 Belvidere Republican.